Breathtaking Sugar Loaf Mountian - Known as "Tatosh" by the Indians, this mountain rises 500 feet above Lake Superior. A hiking trail, complete with 302 steps guides you to the summit with a spectacular view of Lake Superior. 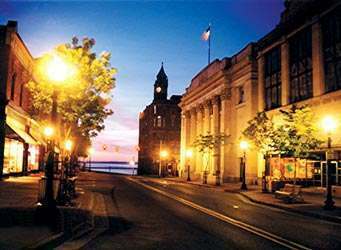 Close proximity to shopping - Downtown Marquette is Lake Superior's civilized gateway to the rustic splendor of Michigan's beautiful Upper Peninsula. Historic brownstone buildings, trees, benches and street lamps line Washington Street and Front Street providing a picturesque setting anytime of the year. Da Yoopers Tourist Trap - A must see! Anything you could possibly want to remind you of the U.P. can be purchased here. Many "interesting" items to see, including the world's largest working chainsaw. Fishing Tours - Lake trout, brown trout, walleye, salmon, steelhead and bass—these are just some of the fish populating our Great Lakes and our 11,000 inland lakes and streams. Whether its charter fishing, sport fishing, or a leisure day on the banks, you're sure to get a great catch in Michigan. Little Presque Isle - Once connected to the shoreline by a beautiful red sandstone cliff, Little Presque Isle is now an island within wading distance of the mainland. This rugged 38 acre island and surrounding area is a popular hiking, and picnicking area. Marquette County History Museum- The museum traces the history of the county from prehistoric copper culture to contemporary times. The museum is also the starting point for walking tours of Marquette's Historic District. Marquette General Hospital - Marquette General Hospital, a federally designated Regional Referral Center, is a vital part of Marquette General Health System, Upper Michigan's largest health care services provider. Marquette Maritime Museum - This museum tells the rich, rewarding story of the Maritime heritage of Marquette and Lake Superior. A must see, open from May 1 until October. The museum is also offering tours of the Lighthouse this summer. Marquette Mountain Ski Hill - Marquette Mountain is the premier ski area for Marquette County. Ski packages are available. Visti our website for more information. Mattson Lower Harbor Park - Located just north of the ore dock in Marquette's Lower Harbor, the 22 acre Mattson Lower Harbor Park has a large grassy open space area, park benches, picnic tables, Kid's Cove Playground (a very large wooden play structure built through community donations and volunteers), an architecturally designed period concession/restroom facility, boat ramp, and a large nearby breakwater. The shoreline bike path runs through the park and an illuminated walkway with period style lighting parallels the waterfront along the bulkhead. Michigan Iron Industry Museum- Amid the forested ravines of the Marquette Iron Range, the Michigan Iron Industry Museum overlooks the Carp River and the site of the first iron forge in the Lake Superior region. Mine Tours - This wonderful museum tells the tale of the Michigan Iron Industry in graphic detail. Admission is free. Mt. Marquette - Originally named Mount Mesnard after the French Jesuit missionary Rene Mesnard, the name was changed to Mount Marquette in 1960 when the top of the 1,200 foot mountain was opened as a local attraction. Accessible by car or snowmobile, the mountain provides a fascinating view of Lake Superior, Marquette, and the surrounding country side, forests and mountains. Northern Michigan University - Northern Michigan University, located in Michigan's unique Upper Peninsula, is a dynamic four-year, public, coeducational university which offers 180 degree programs to nearly 9,400 undergraduate and graduate students. Ojibwa Casino - Enjoy Ojibwa style fun and excitement at the Ojibwa Casino Marquette, nestled on the shores of Lake Superior in Michigan's Upper Peninsula! Presque Isle Park - A 328 acre municipal park known for its outstanding natural beauty. Self guided nature walk and a bog walk as well as a two mile road that circles the island. Many splendid cliffs and overhangs over Lake Superior. Superior Dome - The largest wooden dome in the world, The Superior Dome, is owned by the State of Michigan and operated by Northern Michigan University. Opened in September 1991, the Dome is 150 feet high and is 272,300 square feet. It contains more than 100 miles of Douglas Fir tongue-in-groove decking. U.P. Children's Museum - The premier museum for children. Explore the investigation station and many other exciting things, including being "flushed" down a toilet. You have to see this to believe it. U.S. Ski Hall of Fame - Just a short twenty minute ride to see how skiing got started in the United States. The only National Hall of Fame in the state of Michigan. Upper Harbor Ore Dock - Built in 1911, this 1,300 foot dock was the first pocket dock in the world constructed with steel reinforced concrete instead of wooden timbers. Still active, the 75 foot high dock hosts two to three ore carriers per day during the shipping season. Upper Peninsula Medical Center - For your convenience, the Peninsula Medical Center has a full service computerized pharmacy that offers prescription medicines, over the counter medications, diabetic and ostomy supplies, and specialized Home Health Care and patient counseling Monday-Friday, 8:00AM to 6:00PM and 9:00AM to 1:00PM on Saturday. Waterfalls - You want water, we have it, and then some. Many waterfalls are within only 45 minutes of Marquette and very much worth the drive. Pick up a waterfall map upon arrival and have some fun.